It's that time of year when everyone starts talking about the F word..no not Father Christmas...FASHION WEEK! A time when all the weird and wonderful creatives flock to see what is hot..and maybe what is not. So I decided to head on down and see what the hype was all about. 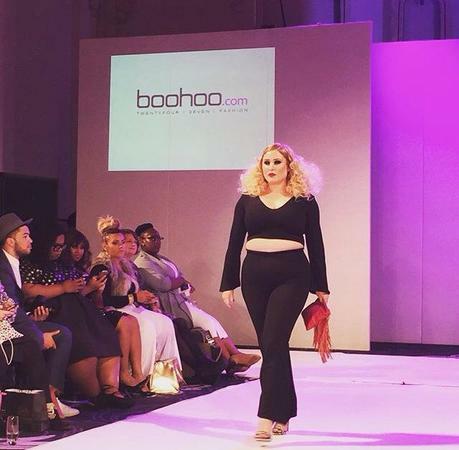 However this was fashion week with a difference this was no ordinary show this was UK Plus Size Fashion Week. I dressed in a cute 70s style swing dress with a suede effect fringed jacket, if I was going to be mingling amongst fashionistas I had to look the part right? A lick of red lippy and I was feeling myself. I met up with some of my curvy model friends on the day and headed to 8 Northumberland place in London, the venue was within a minute from the tube station which when in heels was an extreme bonus! The venue itself was grand and luxurious, a perfect setting. We were greeted by the friendly UKPSFW team and headed to our seats. Waiting in anticipation for the catwalk to begin I soaked up the atmosphere and my surroundings, the catwalk was breath taking and I enjoyed seeing the array of different types of people who had congregated to watch the show...spotting some familiar faces in the process, Jessica Kane, Callie Thorpe and the beautiful Nadia Aboulhosn. So the show begins and my eyes are fixated on maybe not just the clothing but the models which included Top model Hayley Hasselhoff, Olivia Campbell who bought some extra attitude to proceedings and not forgetting some of my personal favourite models Poppy And Mollie from London based Curve agency Bridge Models. All models had the same hair and make up design which was a heavy black eye and a dark red lip teamed with slicked hair on the roots with the rest of the hair crazy and curly. I loved it! The ultimate in high fashion catwalk look. The music chosen for each designer was set perfectly to suit there clothing and I seriously had to hold myself back from breaking away from my seat and strutting down the catwalk as I got so involved and excited by what was taking place. A surprise performance by Jess and the bandits was welcome and kept the spirits high. There was an interval in between the shows where we were whisked downstairs and were offered complimentary drinks and snacks which I couldn't resist. 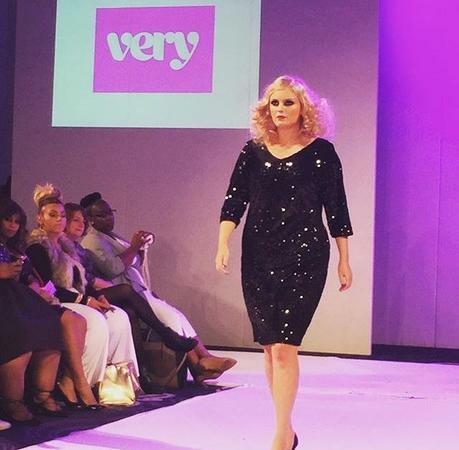 Some of the designers to set the catwalk on fire included Evans, Boo Hoo and Curvissa along with many others. The catwalk was full of tassels, sequins and many jaw dropping designs. Plus size clothing are fashionable to you know. After the show ended Rianne Ward the founder gave a very brief speech, may I say her shyness was endearing and her hard work admirable. So looking at my experience, was I disappointed? Yes I was disappointed when the show finished and I had to make my way back to catch the tube, the only part of the day I wasn't happy about. As part of the MOD family was there enough diversity within the show? 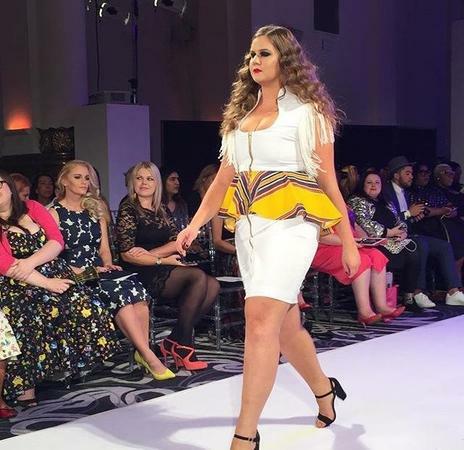 There were plus size models of all body shapes and sizes, a mature model and models of colour represented, however no disabled models were used and MOD have just the girl for that! Is it 2016 yet? As I cannot wait for the next UKPSFW as I can only imagine it will only get bigger and better!